We pride ourselves on listening to our clientele. It is for this reason we have made an addition in the products we offer: we now provide the Dymo LabelWriter 450 Turbo (http://www.dymo.com/en-US/labelwriter-450-turbo-label-printer) as an option for printing your labels. We used to advertise that you did not need a special printer to print your labels (you still do not), and we advocated the Brother DCP-L2540DW (you still have this option). After listening to how we could be even better for our customers, we decided to provide the best for them. Customization. It’s what we can do. And both options allow you the ability to print two different labels. Some do not want to, or do not have the time to, print out a sheet full of labels and cut them to size (and then go from product to product to label the shelves). It is for this reason that we decided to go with the Dymo LabelWriter 450 Turbo label printer. It prints as quickly and efficiently as printing out a receipt. The Dymo Label Writer 450 Turbo option provides a way of convenience. If you decide to go with this option, all you need to do is enter the information you want in your Cheers POS System, print, peel, and stick. There is no cutting and formatting, just print and go. We want to provide the best for our customers, which is why we offer choices; Cheers POS allows you to choose what you want to do what is best for your business. 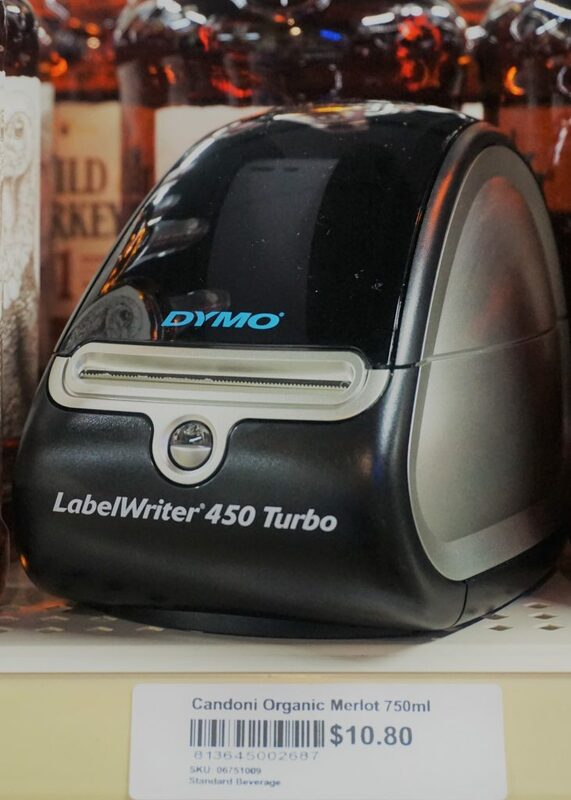 Dymo LabelWriter 450 Turbo — Because: YOU!!! We thought we had a perfect solution regarding label printing, but, our customers showed us we could do better for them. Our owners are very much involved in Cheers POS and they spent a lot of time deciding the best label printer in appreciation for our customers. We knew it had to be fast, neat (as in readable and not smudging), and technological. We worked hard to fully integrate this with Cheers (for, you see, everything we add to our system, has to sync up with it). It works perfectly with Cheers POS and is super easy to use AND efficient for your needs. Again, we want all of our customers to be happy and 100% satisfied with Cheers POS, which is why we still offer the Brother printer option (or, if you have your own printer that is compatible, we are glad we can save you money). You helped us to allow all our customers to have this option (can YOUR current point of sale system’s manufacturers say the same thing?). Thank you for your input.